If a garden sparkles in rain then it’s a gem for sure. 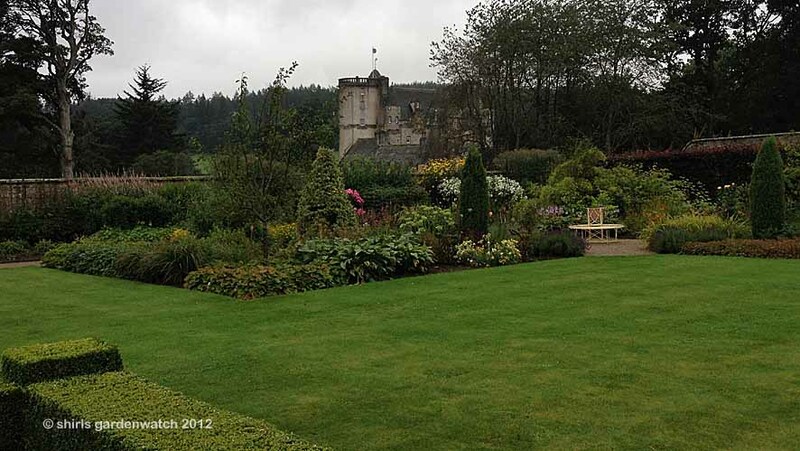 Truth be told, when we took the soggy jog from the car park to the tearoom at Castle Fraser, back at the end of August 2012, I didn’t even consider a garden wander. It was a wet, chilly and windy day – no surprises there based on last summer’s weather. Our visit to Castle Fraser was simply a time passer after a daughter drop-off and expected pick-up again in a few hours. 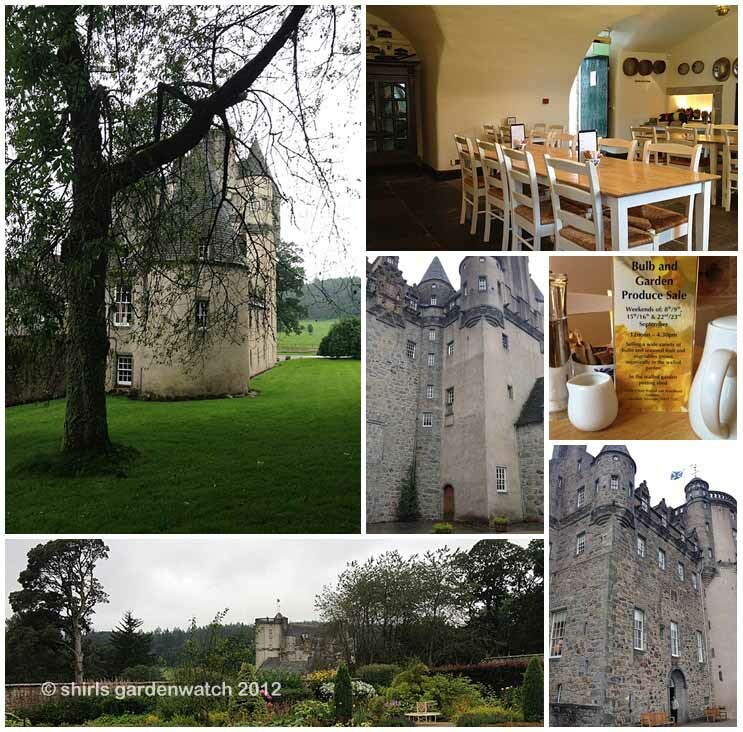 Instead of spending time in the busy City of Aberdeen we headed out west for 16 miles for a wander round a Scottish Castle and some refreshments to warm us up. We began our visit through the rear courtyard en route to the tearoom. The photo above was not taken by me but kindly available through Wikipedia Commons. The tearoom was on the left and a Gift Shop was on the right. As you will see below, the tearoom was bright and airy. A September Bulb and Garden Produce notice caught my eye on the tables (2 weekends during the month) and I had intended promoting it. 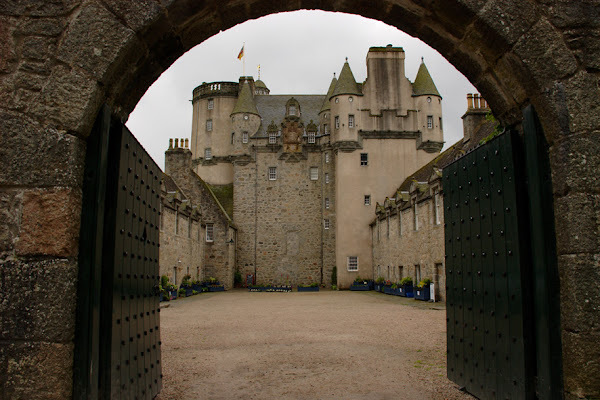 I’m guessing this is an annual thing so if you check the website events page during 2013 you’ll get details of it and other stuff going on at NTS Castle Fraser. 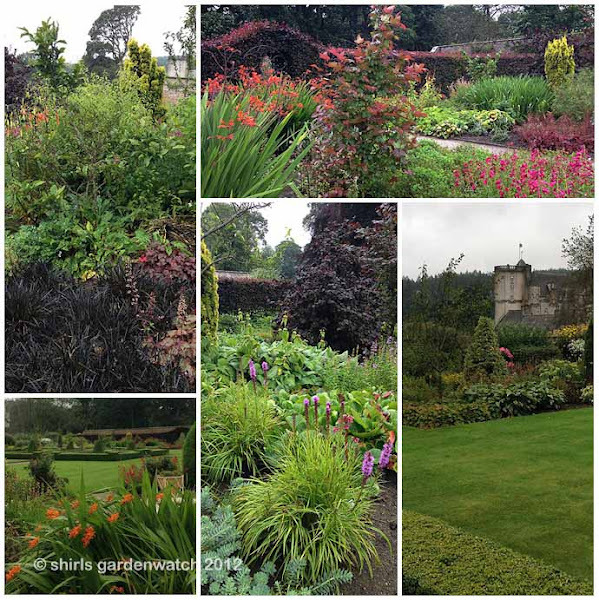 My snapshots of Castle Fraser are exactly that – small shots taken using my phone in a hurry so it wouldn’t get wet. Fighting with an umbrella too, we had one focus and that was to find the entrance door. Being truthful, I was disappointed not be allowed to take photos inside the castle but fully appreciate why. For those interested in a peek inside and some History of the Castle I thought this Undiscovered Scotland page was good. You can also browse through slideshow images on the main NTS page for the castle. For anyone new to gardening, there are a wealth of books and magazines with images to inspire you when you set out deciding what to do with your new outdoor space. My recommendation would be to take the full 3-D surround view you get with walking through an established garden that is open to visitors. My eye was instantly drawn to this planting above with the chocolate foxgloves (a new addition to my garden earlier in the year). I took a good look to see what planting combinations were used here. What's great about 'real' garden visits is that you can walk around plantings to see them from all different angles. I like to do that. 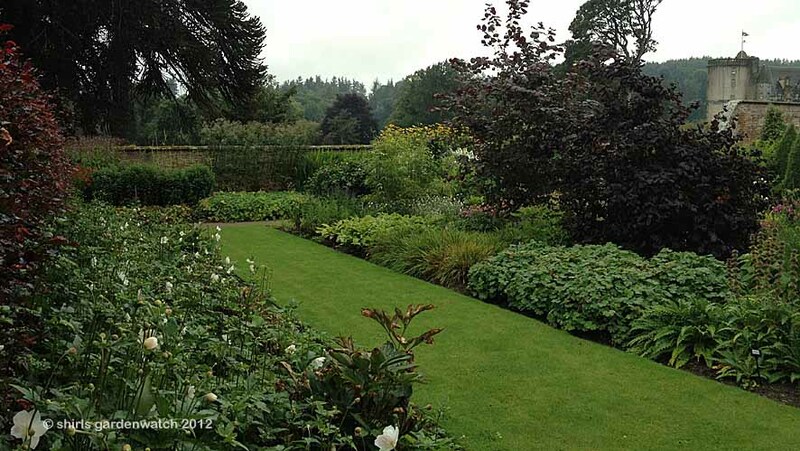 I loved the deep planting and plant choices for height, texture and colour in the borders of this garden. 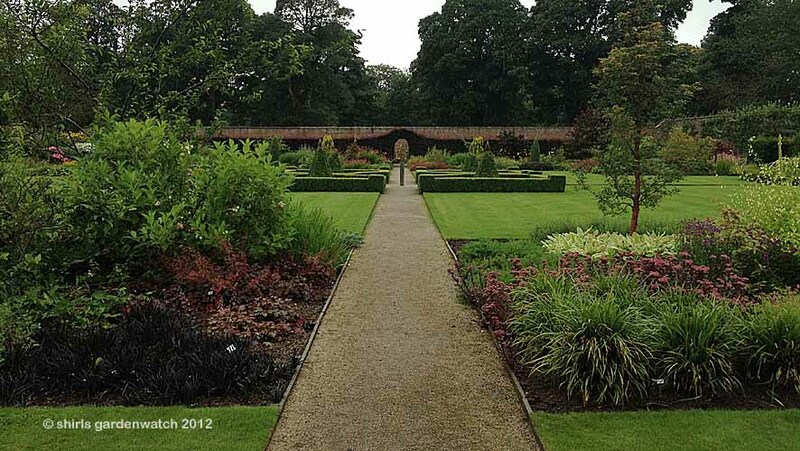 This was a walled garden that was formal but at the same time so many ideas could be taken away. I loved the copper beech hedges at two ends drawing you through. The cornered beds looked great from every angle and also drew you in. This design looked like it could be transferred quite easily to a smaller garden setting. 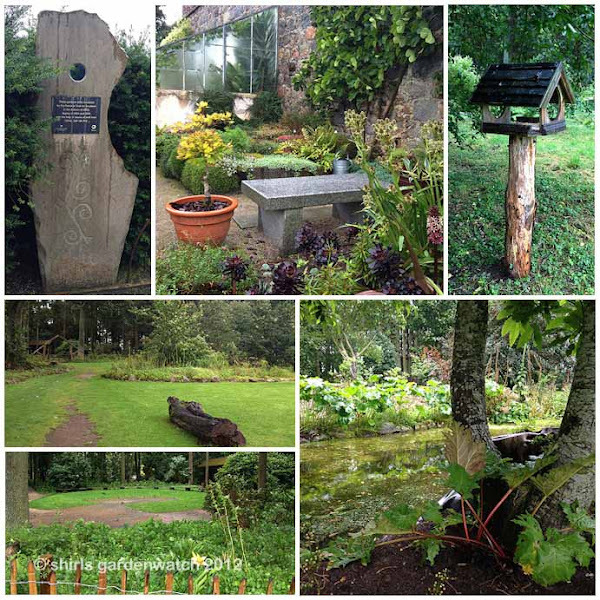 We really can get inspiration from garden visits. On leaving the walled garden I found a stone sign in a hedge of Yew and realised I could have had a different view if I had entered from this car park side. I was making a hasty exit back to the car with the rain getting harder. My travelling companion daughter and OH were waiting for me there. A very wet bird table caught my eye outside the walled garden. There were bird feeders on tree branches but what was I seeing in the distance? I walked on (getting distracted for a moment or two by a wildlife pond nearby). 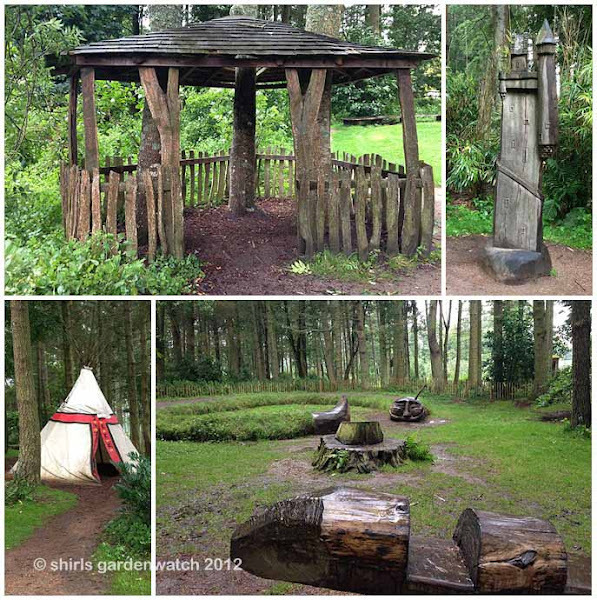 I found I had wandered into a woodland garden with bamboo, azaleas and rhododendrons (not in flower). I was also in a Woodland Secrets adventure playground that looked like it could double up as a theatre space. Even in its muddy state it had a magic about it. What I loved about the walled garden at Castle Fraser was its use of architecture in its hedging and the deep colours that were included in the plantings. I bet it looks fantastic in winter. Yes, it was a formal garden, but when walking through I felt a sense of personal space too. Perhaps that was because a lot of the plants were favourites of mine and I am exploring colour more myself. I’m thinking January will likely be a bit of a birdy blog post month but I hope to throw in some garden/plant stuff too. The RSPB Big Garden Birdwatch is at the end of the month and I’ve had some thoughts on that. I've a post due on my seed trial too. I am loving to see this garden right now. My garden is still covered with snow. I hope by this weekend to be able to walk the garden without getting snow in my wellies. This place is gorgeous. Something for everyone. I am going to pop over to the links you shared. Have a great weekend. Now that looks like my idea of a castle Shirl and I really enjoyed the tour of the garden. 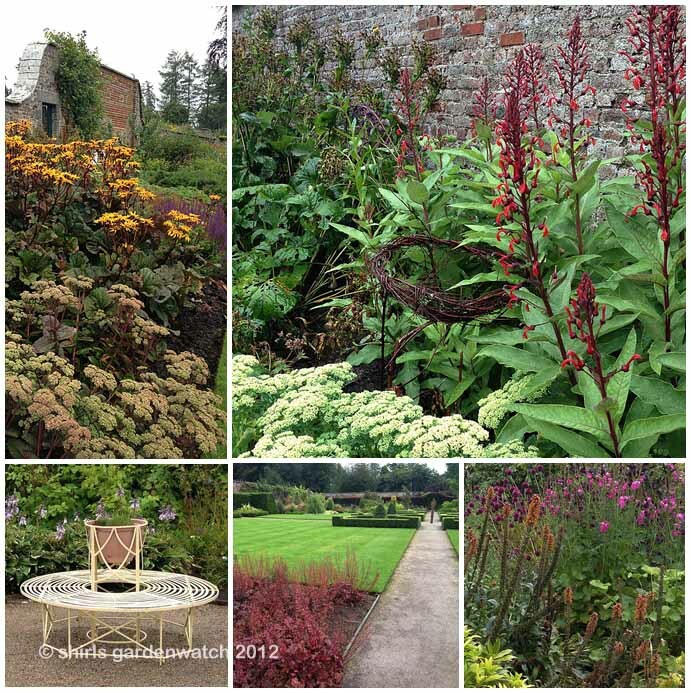 Plenty of gardening plans here and a blog spring clean in the pipeline too. I just need to get all my ideas down somewhere concrete soon, rather than have them floating around in my head. Have just noticed your note that you have removed the anonymous option. Think that I will have to do this too :( Hope that OH's blog is a success and will pop in to say hello to Angie. I enjoyed my visit to your blog!!! So many great garden and wildlife shots, and so much to see here! I've wanted to see Scotland for years, I suppose this is one way to do it. Really enjoying this blog...I'm going to go and look around here some more now. 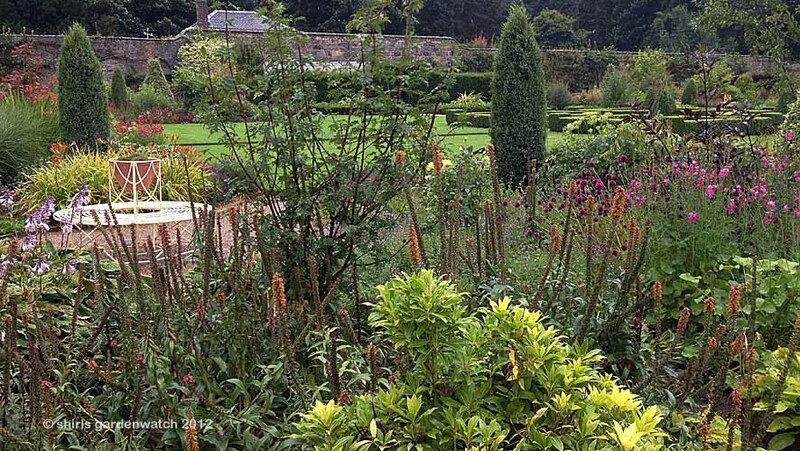 I forgot to say the Gunnera post which shows on my sidebar isn't showing on your blog! Hello again Jan, it was a rushed visit round the garden in the rain and OH & A missed the garden completely. It would have been nice to walk around the outside of the castle more and around the grounds and walks too – another visit perhaps. No, not surprised on the bird table at all. Thanks for you good wishes and thumbs up on my missing blog post. I wonder if the latest one will be okay. Nice to see a post from yourself – I’ll be over to see properly tomorrow (phone preview so far).